We recently headed over to Merry Hill to have breakfast with Peppa Pig, and were generously given a few Peppa Pig goodies while we were there. Some of these are “surplus to requirements” (aka I kept them away from the kids long enough to save a few bits from them) and so I’ve decided to give a little selection of Peppa Pig goodies here on my blog. The goodie bag contains: a Peppa Pig poster, a Peppa Pig badge (with child safety “pin”), a set of Peppa Pig foil stickers (very sparkly!) and a paperback book “Daddy Pig’s Old Chair”. 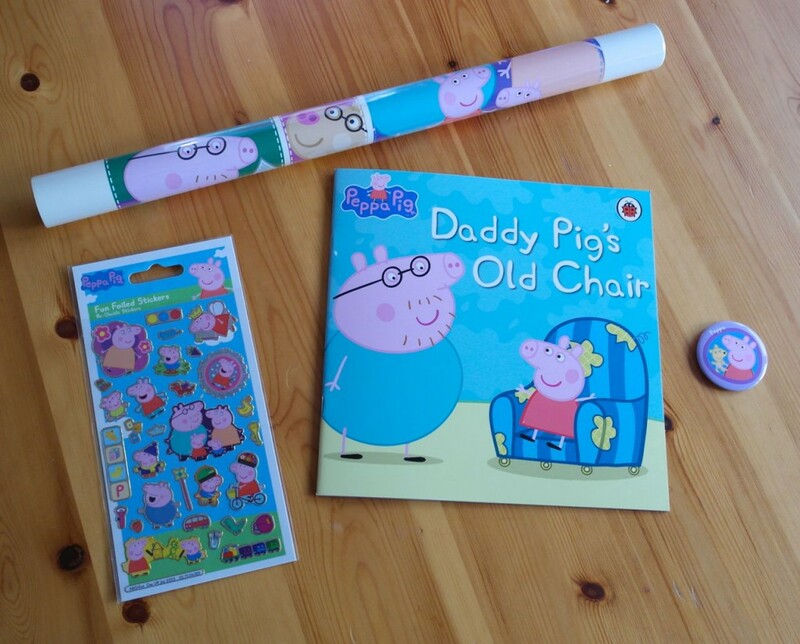 To enter this giveaway, just comment on this blog post telling me who your favourite Peppa Pig character is, and then record your entries on the rafflecopter widget below. Thank you for entering, good luck! This competition ends at midnight on 11/05/14. There will be one winner for this giveaway. This giveaway is not associated with “Official Peppa Pig”. Mummy rabbit! She just seems to get so much done AND stay calm! !